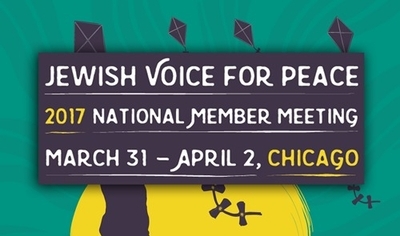 There's a simple way to end global oppression, racism and immediately create a world overflowing with "equality, dignity and human rights," panelists agreed Saturday morning during a Jewish Voice for Peace (JVP) Conference in Chicago. Simply eliminate Zionism from the planet. "Arguing for a softer, less harsh, nicer version of capitalism, colonialism and racism won't do it," said Black Lives Matter leader Rachel Gilmer. "Many liberal Zionists believe that the problem with Israeli apartheid is simply a few bad policies, or Netanyahu, or the wall, but the problem is with the ideological foundation of the state itself: Zionism. Zionism at its core is white supremacy." While JVP claims its mission is to "end to the Israeli occupation of the West Bank, Gaza Strip, and East Jerusalem; security and self-determination for Israelis and Palestinians," the conference so far has failed to mention any plan that keeps Israel intact. That's not a surprise. JVP prides itself for playing a key role in the Boycott, Divestment, Sanctions (BDS) movement that pressures corporations, churches, and colleges and to drop investments in Israel. "A world without Zionism is a world without oppression" and create "equality, dignity and human rights," said panelist Lubnah Shomali of the Badil Resource Center for Palestinian Residency & Refugee Rights. Shomali's claim ignores human rights violations by Palestinian leaders against inside the West Bank and Gaza. Hamas and the Palestinian Authority use intimidation to silence journalists who dare to engage in peaceful criticism, Human Rights Watch (HRW) reported in 2016. Journalists face arrest and detention for exposing corruption. The Palestinian Authority and Hamas flout international law by issuing death penalties, using torture and extrajudicial killings. While speakers during Saturday's "Let's Talk About Zionism" panel tossed around "apartheid" accusations, they ignored the rights enjoyed by Israeli Arabs, including representation in Knesset and prominently in Israel's judiciary. No one on the JVP panel mentioned this. Nor did anyone advocate a peaceful resolution to the conflict that leaves Israel intact. Jewish Voice for Peace, therefore, let an entire panel push the message that Zionism, the belief in a national homeland and refuge for Jews, should not exist. Ethiopian Jewish activist Efrat Yerday, an Israeli citizen, also claimed that Israel engaged in racism by forcing Ethiopian Jews to convert to rabbinical Judaism. Ethiopian Judaism contains numerous elements that predate modern rabbinical Judaism and has similarities with Ethiopian Christianity. This caused Israel's rabbinate to mandate that the Ethiopians convert first. "Zionism does not only dispossess Palestinians, but it also dispossesses in a very sophisticated way, non-white Jews. Being Jewish is highly identified with being white because of Zionism," Yerday said. "This early fantasy that was shaped by the visionaries was to be a small Europe in the heart of the barbarian Middle East." Ironically, Yerday noted that Ethiopian Jews were able to peacefully demonstrate and protest against what they perceive as injustices against them. Such a display would not be allowed in neighboring Arab countries or in areas ruled by Palestinians. And she didn't try to reconcile the "Israel is racist" line with the history of how thousands of black Ethiopians became citizens. In 1984, Israel rescued 16,000 Ethiopian Jews in a secret airlift. That was followed by "Operation Solomon" in 1991, in which 14,000 Ethiopians were flown out in just 36 hours. And the country named an Ethiopian immigrant, Yityish "Titi" Aynaw, as Miss Israel in 2013. Like any other country, there is racism in Israel, she said. But "it's something that Israel is trying to fix and it's actually improving," she said. Israel's enemies have tried connecting Zionism with racism for decades in an effort to delegitimize Israel. During her remarks, Shomali lamented the fact that a 1975 United Nations resolution condemning Zionism as a form of racism was repealed in 1991. Her case for labeling Zionism as a form of racism relies on a cherry picked one-sided history dating back to Israel's 1948 independence. Zionism developed as a purely secular movement that hijacked Judaism, she said. The two were not intertwined. "There had to be a link made between secular colonialism, secular Zionism and religious Judaism," Shomali said. "Members of the Zionist movement went to religious Jews around the world and told them that ... God is telling you to come to Palestine. You are the chosen people. This is the promised land. A land without people for a people without a land, knowing full well that Palestine was not a land without people." Zionists used the forcible transfer of populations to cleanse Palestine of Arab natives, she said. The role Arab governments and militias played in creating the so-called Palestinian Nakba, or catastrophe, appears nowhere in her analysis. She never mentioned the rejected 1947 U.N. resolution offering the Arabs a state. Nor does she mention that Arabs started the 1947-1948 war in Palestine. Not only that, the Zionists called on Arab inhabitants of the then proposed state of Israel to remain and work for "peace and progress as sovereign equals" in October 1947. The day after the U.N. partition vote, the Jewish agency called for "fruitful cooperation" with the Arabs. In August 1948, John Bagot Glubb, commander of Jordan's Arab Legion, told the London Daily Mail, "Villages were frequently abandoned even before they were threatened by the progress of war." JVP's rabid hatred of Israel comes into even clearer focus Sunday, when it gives the stage to Rasmieh Odeh, a member of the Popular Front for the Liberation of Palestine (PFLP) terrorist group convicted for leading two 1969 bombing attacks in Jerusalem. One of those bombings targeted a grocery store and killed two college students. This conference and the choice of speakers is just another reminder that Jewish Voice for Peace opposes the Jewish State and its prescriptions will lead to anything but peace.